"Carl did a really good job. Thanks very much!" 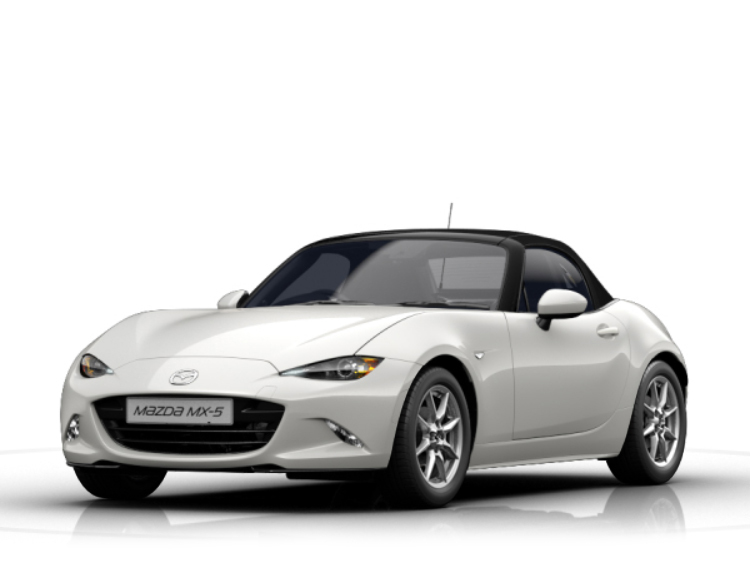 The Mazda MX-5 you searched for (KX68SJU) is no longer in stock. Here are more cars which might be of interest. Finished in 'Deep Crystal Blue' Paint and 17inch Bright finish alloy wheels our Mazda MX-5 comes with specification including Alpine satellite navigation, 6 speakers, Auxiliary input socket, DVD System, Bluetooth telephone connectivity, Cruise control, Leather upholstery with heated front seats, Sports seats, Alloy pedals, Sports suspension, Power retractable roof, Green tinted windscreen, Windblocker, Climate control air conditioning, ISOFIX front passenger seat child seat compliance and much more! Zoom into spring in our sporty two seater! Our MX-5 offers great mileage and qualifies for Warranty 4 Life! Finished in 'Crystal White Pearl' Paint our Mazda MX-5 comes with specification including Cruise control and speed limiter, Hill hold assist, Lane departure warning system, Rear parking sensor, 7inch touchscreen with multimedia commander, Satellite navigation system, LED daytime running lights, LED Headlights, Heated front seats, Sports seats, Bose premium 9 speaker system, DAB Digital radio, Auxiliary input socket, Integrated Bluetooth with steering wheel mounted controls, Smart keyless entry, Windblocker, Rain sensing front wipers, Engine start/stop button, Remote boot release, Premium cloth soft top with integrated heated glass window and soft top cover and much more! Our sporty two seater comes loaded with fantastic features including Heated Seats and BOSE Premium 9 Speaker System! Mazda MX-5 Sport Nav Fitted with Sports Alloys, Leather interior, Heated Front Seats, Touch Screen Media system with Sat Nav, Connections for Bluetooth, USB and AUX, BOSE Sound System, Electric Windows, Remote Central Locking, Rear Parking Sensors, Automatic Wipers and Lights, Auto Air conditioning, Cruise Control with Speed Limiter, Steering Controls. Very low mileage for its age and recently serviced in January this year by us. Stunning sporty two seater which is part of our 'Nearly New' range. Mileage may vary. Book your test drive today! Ex-display model 2019 registered with a Huge Saving off the new list price! Demonstrator Model (Mileage subject to change) Mazda MX-5 RF Fitted with Touch Screen Media system with Sat Nav, Connections for Bluetooth, USB and AUX, Electric Windows, Remote Central Locking, Air conditioning, Cruise Control with Speed Limiter, Steering Controls. Demonstrator vehicle dealer owned and maintained available for sale soon.